Russian President Vladimir Putin has signed the anti-Magnitsky bill banning adoptions of Russan children by U.S. families. This means that the U.S.-Russia adoption agreement will be canceled in January 2013. President Vladimir Putin has signed the "Dima Yakovlev law," which retaliates against the U.S. Magnitsky Act. The Kremlin reported on Friday that the president signed the law "On Measures Affecting Individuals Involved in Violations of Fundamental Human Rights and Freedoms and Rights and Freedoms of the Citizens of the Russian Federation, which was adopted by the State Duma and approved by the Federation Council. The measures include a ban on visits to Russia of U.S. citizens involved in violation of fundamental rights and freedoms, persons who commit crimes against Russian citizens abroad or bear a relation to such crimes. In addition, the ban will be expanded to officials who assist with their activity or inactivity in the exemption from punishment of persons who commit crimes against Russian citizens or bear a relation to such crimes. Persons involved in the abduction and illegal deprivation of freedom of Russian citizens and those who pass unfair sentences on Russian citizens and prosecute them without lawful grounds will be also included in the Dima Yakovlev blacklist. The measures also include the arrest in Russia of financial and other assets of U.S. citizens prohibited from visiting Russia and the ban on any property or investments of these citizens. The list of U.S. citizens prohibited from visiting Russia shall be kept by a federal executive agency supervising international relations of Russia. U.S. citizens added to the list envisaged by the federal law are prohibited from disposing of property in the Russian territory. The activity of legal entities controlled by these citizens in the Russian territory is suspended, and their powers (membership) in the boards of directors or other governance bodies of organizations registered in Russia are suspended, too. The federal law binds the federal executive agency keeping the NGO register to suspend the activity of NGOs engaged in political activity in Russia, which receive monetary and property donations from citizens (organizations) of the United States or implement on Russian territory projects, programs or other undertakings endangering the interests of Russia. The law also prohibits Russian citizens who are naturalized by the United States from being members or heads of a NGO or an NGO unit or a unit of an international or foreign NGO (its division, branch or representative office) engaged in political activity in the Russian territory. A violation of this ban shall lead to the suspension of the activity of such NGO. Organizations the activity of which is suspended by the federal executive agency keeping the NGOs register shall be added to the list kept by the federal executive agency supervising international relations of Russia. Furthermore, the federal law prohibits the adoption of Russian children by U.S. citizens and operation of bodies and organizations selecting Russian children for adoption by U.S. citizens in the Russian territory. Due to the ban on the adoption of Russian children by U.S. citizens, Russia is terminating the inter-country adoptions treaty signed with the United States in Washington DC on July 13, 2011. The Russian law retaliating against the U.S. Magnitsky Act will come into force as soon as it is published, after which Russia will notify the United States of its decision to revoke the agreement on adoption of children, the Russian president's press secretary Dmitry Peskov told Interfax. "The anti-Magnitsky Act bill, which has already been signed into law by the president, will come into force as soon as it is published on the president's website and in Rossiiskaya Gazeta [newspaper]," he said. Immediately thereafter, "Russia will notify the U.S. of its decision to revoke the child adoption agreement," Peskov said. "The agreement will cease to be in force a year after [the U.S.] is notified of its revocation. But adoption [of Russian children by Americans] will effectively stop starting from Jan. 1," he said. The document itself offers a mechanism for revocation, he explains. Asked about the list of persons who will be subject to the anti-Magnitsky Act law, Peskov said that "this list has been compiled, but will not be published." Meanwhile, Russian presidential ombudsman on children's rights Pavel Astakhov confirmed that Russia is withdrawing from the Russian-U.S. agreement on international adoptions on January 1, 2013 and the document will no longer be valid. "We are not talking about denouncing this agreement," he added. "Russia is withdrawing from the U.S. agreement on adoptions." 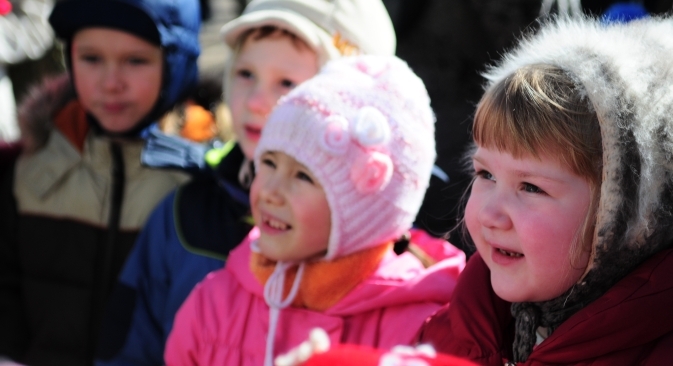 Astakhov believes the governors of the Russian regions should personally control the adoption in Russia of the orphans who were prepared to depart for the U.S. to be adopted by U.S. families. "There are 52 such children," he said. "I believe they should be adopted under the governors' personal responsibility." At the same time amendments could be made to the Dima Yakovlev law in the future, Russian Justice Minister Alexander Konovalov said. "The practice will show in the future whether some adjustments should be made, and if yes, we will do so," Konovalov told Interfax on Friday. Konovalov denied that the Justice Ministry criticized the law. "We had some proposals of a technical-legal nature," he said. "Some of them were taken into consideration, including when the bill was passing through the State Duma." He explained that the Justice Ministry's proposals concerned primarily the law's compliance with international documents. "Some proposals could have been taken into consideration and others could have not. So many lawyers, so many opinions," he said.